Our WD-40 BIKE range is specifically designed for those who prefer pedal power to an engine, and who love cycling through all weathers and conditions. Cycling isn’t just a hobby; it’s a way of life. Knowing how much you value your bike’s condition, we’ve designed our WD-40 BIKE range to be your go-to when servicing, maintaining and riding. We’ve researched and developed our BIKE range extensively with cycling teams and experts, to provide a best-in-class product family that provides an answer to your every need. From amateur cyclists on a Sunday run, to leading athletes in road and off-road racing; people across the spectrum rely on our products to maintain and extend the life of their bike. Now you can worry less about the conditions, and more about the road ahead. With WD-40, you can cycle whatever the weather! Our BIKE range has a product to suit every situation. For a quick-drying effective degreaser which cleans chains, deraillers and cogsets, WD-40 BIKE Degreaser is the perfect choice. If you want a high quality PTFE Lube for maximum lubrication in any weather, try BIKE All Conditions Lube. 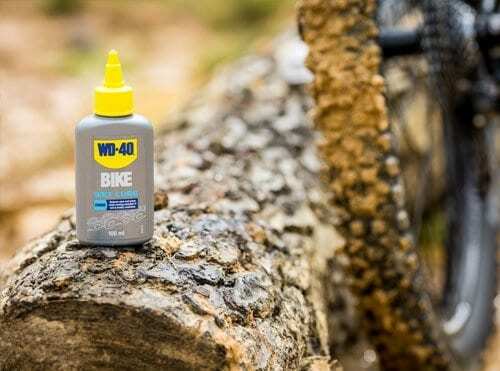 For an all-in-one spray that easily removes mud, dirt, and reside from your bike, there’s WD-40 BIKE Cleaner. And for specially formulated lubrication suitable for extreme conditions, BIKE Dry Lube and BIKE Wet Lube work best. Use these for either dry and dusty conditions or very wet and muddy environments, respectively. Whatever the weather, you can be sure WD-40 BIKE has you covered.